Boa Vista island situated in the mid-Atlantic is surrounded by a shallow reef making this area home to a huge variety of sea life including whale sharks and Manta rays. A number of hidden reefs along with strong currents and high iron content in the islands rocks, that will misconstrue a ship’s compass, have led to numerous wrecks around the island. 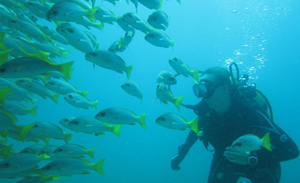 Although coral reefs are pretty much non-existent off this island, Boa Vista offers pristine clarity, warm waters and experiences for all levels of divers.